Back to the present day, and these near-ideal transducers have become a sought-after rarity. Maybe not in this country, where we are all too sophisticated to play with simple radios, but a quick surf of the 'World Wide Web' reveals that there are many amateurs in the USA and Europe keen to re-live the thrill of batteryless radio. I myself had little inclination to do the same until I accidentally came across a Website at www.provcomm.net/pages/joe/loopxtal.htm which describes the construction of an entirely portable crystal set using a loop or frame-style aerial. Now, I had never really believed that a portable crystal set, free of the restraints of a long wire aerial and stout earth connection was possible, so I was intrigued to say the least. Now, the 16-turns-around-a-13in-square-frame aerial takes about 80 feet of wire all told, so I should have had faith in its ability to pull in a station or two; anyway, I had to have a go. Two 18in battens in a cross, 80 feet of wire, a tuning capacitor, a germanium diode and Herbert's headphones later and I was holding a truly portable crystal set! Eureka! I started off with an OA90 diode and the signals were faint but intelligible, with 'Radio Five' dominating the dial. Here things got interesting. I decided to try a variety of germanium diodes in the circuit to see if there was any discernable difference in performance. I didn't really expect any, but a few years ago, alarmed at the dwindling supplies of such devices, I purchased a couple of every type I could find for just such an experiment. I also had the usual bargain' devices available too. I tried the various point contact' type devices OA90, 91, 95 without much effect, and some bargain types which were, predictably, useless. Lastly I tried a different type, an OA47 'gold-bonded' type and - vive la difference! The signals increased markedly in volume and the overall improvement was most impressive. Trying an OA47 from a different supplier had exactly the same effect. Now, I have never seen any article promoting this device in a diode detector circuit, so why was it so good? The first thing I did to try to investigate this, after I had tried a reasonable selection of devices, was to have a look at their current voltage characteristics on the trusty workshop oscilloscope. Clearly, there were some differences in the forward bias region - the useless 'surplus' devices were awful. All of them worked as rectifiers, however, and looked the same in reverse bias. The next thing to try was to have a closer look at their forward voltage characteristic (Vf) using the 'Diode' test setting on the digital multimeter. Many DMMs have such a function nowadays, but many of the manuals fail to tell you that what is usually being measured on the three-digit scale is the voltage across the device in mV at a particular current (about 1 mA). In reverse bias, this is effectively infinite and the DMM gives an overflow' display with a good diode. In forward bias, the display is commonly about 650 (mV) for a silicon diode and 300 (mV) or so for germanium. By swapping the leads you can get a fair idea if the device is good and which end is the cathode. 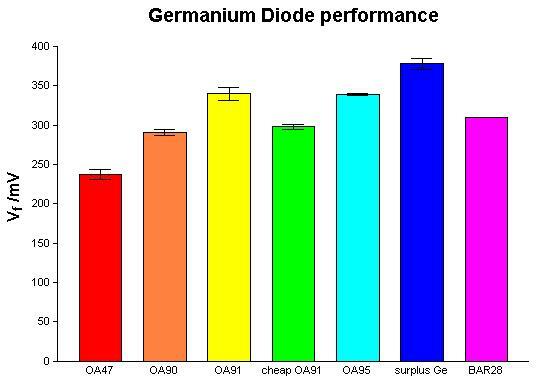 I set about measuring the forward voltages of every germanium diode I could lay my hands on to see if the values varied significantly from one device to another, and the results are shown in the accompanying chart. The devices were categorised as OA47, OA90, OA91, some 'cheap' OA91s, OA95, 'surplus', and, for good measure, I bunged in a value for a BAR28. This is a silicon 'Schottky' device with a low Vf, comparable to germanium, and these devices are sometimes advertised as suitable replacements for the latter. The chart shows average Vf values for the devices and an indication of the scatter in similar devices although, for example, only two 'full-spec' OA91s and OA95s were tested, so don't read too much into that! The result, and the reason why the OA47s were so superior, is clear from the chart. The OA47s (seven devices from two manufacturers) have by far the lowest forward voltages. In a crystal set, Vf represents lost signal, and further measurements on the set itself suggested that only about 30-50 mV was getting through to the headphones. If 240 mV had been lost across the diode then presumably there is less than 300 mV to begin with! Hence it is hardly surprising that the higher Vf diodes leave nothing left over to listen to! A more 'traditional' crystal set would doubtless produce a stronger signal, but the desire to lose as little as possible is still paramount, and an OA47 would still doubtless give a superior performance. They are a bit more expensive than the point contact types 30p as opposed to 10p but are hardly going to be the most expensive component. If you're going to play with any radio circuits with diode detectors, these have got to be the devices of choice unless you have very accurate biassing, with the proviso that the point contact devices might have superior performance at very high frequencies. To end this article, a couple of footnotes and a plea. Firstly, I am lucky enough to have a couple of DMMs, both offering a diode test facility. They agree completely with each other over all the voltage, current and resistance ranges, but the newer one gives diode measurements 40% higher than the old one! Separate experiments indicate that the older one (used here) is in fact the more accurate. I can only put this down to poor calibration of the new DMM for this one function. Secondly, it is interesting to note that each of the devices featuring in the chart has a 'characteristic' forward voltage with very little scatter; this suggests, for example, that the 'cheap' devices I bought labelled "OA91-type" are more likely "OA90-type"! Finally, there are a couple of devices not featured here. The AA119 is mentioned in quite a few 'Crystal Radio' books, but does not seem to have been available for a few years. I have seen similar part numbers (e.g. 'AA112') mentioned in European enthusiasts' Web sites. In the States, the 1N34A device seems almost ubiquitous. If anybody has one or two of these devices to spare (or is just off to the States for a holiday and has time to call into Radio Shack for a ten-pack of 1N34As), I will happily reimburse costs or swap a couple for OA47s, so please contact me. Meanwhile, happy listening! Copyright Philip Miller Tate 1999.